I’ve always considered David Cronenberg’s remake of The Fly to be the dark side of Spider-Man’s origin story. In that film, a scientific accident blesses a bookworm with amazing new abilities, but those new found gifts come at a horrific price. Raimi’s Spider-Man trilogy largely ignored that side of the character’s world. Director Marc Webb seems willing to court it, if only slightly, in this summer’s The Amazing Spider-Man. Hints of it can be seen in the latest video blog from the production, which focuses squarely on actor Rhys Ifans and his portrayal of Dr. Curt Connors, aka The Lizard. The 100 second featurette is comprised of new footage interspersed with interview clips. It offers some back story as to Connors relationship with The Parker family. The most interesting part is a wonderfully icky moment where Connors grows a new right arm as a result of injecting himself with Oscorp’s mutagen. It’s a nice little glimpse into the dark, perverse underbelly of the Marvel universe. Unfortunately, the effect is ruined somewhat by the full reveal of the Lizard. 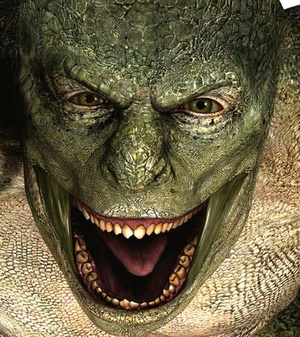 The creature is fully rendered in CGI, and looks like a green chupacabra. I much prefer the “alligator in a lab coat” design from the comics, but perhaps this was easier and deemed more cinematic by the filmmakers. At any rate, I’m not impressed.